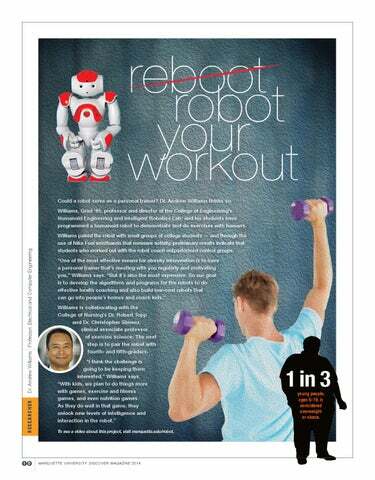 reboot robot your workout Could a robot serve as a personal trainer? Dr. Andrew Williams thinks so. Williams, Grad ’95, professor and director of the College of Engineering’s Humanoid Engineering and Intelligent Robotics Lab, and his students have programmed a humanoid robot to demonstrate and do exercises with humans. Williams paired the robot with small groups of college students — and through the use of Nike Fuel wristbands that measure activity, preliminary results indicate that students who worked out with the robot coach outperformed control groups. “One of the most effective means for obesity intervention is to have a personal trainer that’s meeting with you regularly and motivating you,” Williams says. “But it’s also the most expensive. 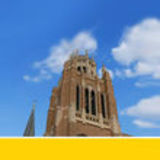 So our goal is to develop the algorithms and programs for the robots to do effective health coaching and also build low-cost robots that can go into people’s homes and coach kids.” Williams is collaborating with the College of Nursing’s Dr. Robert Topp and Dr. Christopher Simenz, clinical associate professor of exercise science. The next step is to pair the robot with fourth- and fifth-graders. “I think the challenge is going to be keeping them interested,” Williams says. “With kids, we plan to do things more with games, exercise and fitness games, and even nutrition games. As they do well in that game, they unlock new levels of intelligence and interaction in the robot.” To see a video about this project, visit marquette.edu/robot. 1 in 3 young people, ages 6-19, is considered overweight or obese.